Champagne Wishes and RV Dreams: Have you had a good laugh today? 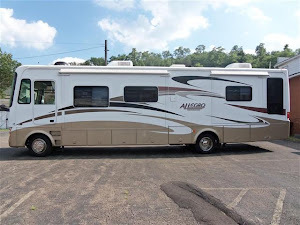 Going from a full-size house to a motorhome full time, I knew would be an adjustment. No matter the size of the RV, one has to "down-size". We have a beautiful 35' Class A, so it's not "tiny", but it still doesn't hold "everything". When I was making the decisions on what to store away vs what to take in the motorhome, I had to do my best guessing at what I would need, want & use most for the next year or more. Not so easy. We are now in our 9th month of travel, so I am learning what I brought "to much of" and what I wish I would have packed. Most things are easy to adjust to, then there are the "surprises". Today was "one of those days". Jack and his cousin were off enjoying a full day of "guy stuff". I had decided this would be a great opportunity for me to make all of us a fun, full meal to end our great visit with John & Linda before we take off on our next trek. As I was planning the meal, I decided that I would make an apple strudel for dessert, to use up some of the plethora of apples I had gotten from a local farm here. So, as I was checking to see what pans I had for the various components of the meal, I realized I hadn't packed a cookie sheet - guess I didn't think I was going to bake any cookies (I haven't, obviously). Well, I would just have to improvise using an oblong baking pan. Not the size that I wanted to do, but "I'll work it out somehow" I thought. Then, this morning while taking Jack to meet his cousin, we stopped at a local hardware store to pick up a special axe John had told us about. What a great store this was! Doherty Hardware (Somerset PA) is full of all sorts of fun cooking supplies, baskets, home goods and just the kinds of stuff that the old time 'mercantile' stores had. There, I found a cookie sheet! "Yea for me", I thought. 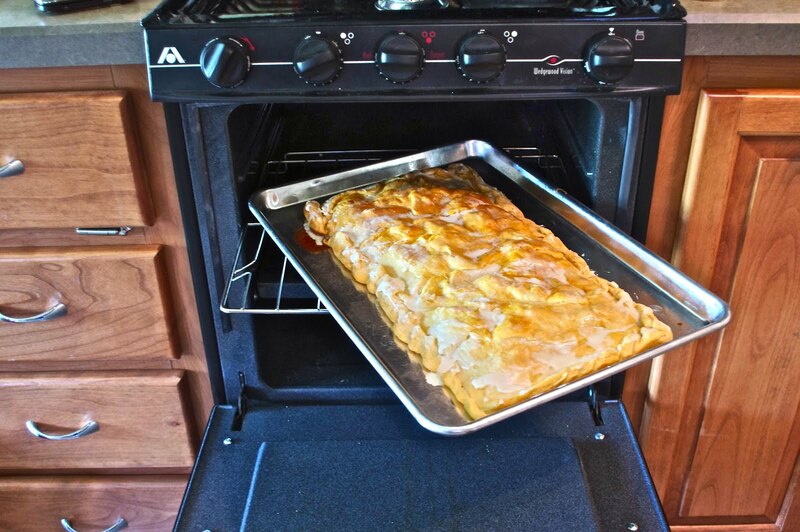 So, once home I created my wonderful apple strudel to the full-size I wanted (I have so many apples!) in this great new cookie sheet, and proceeded to put it in the oven. Here's my laugh for the day folks, it was to long! I had forgotten that I only have a small size oven, and that's why I hadn't packed any of the cookie sheets from the house! Now, what to do? Well, I couldn't take it off of the pan, as it would really fall apart and I wasn't up to that! Sooo, I improvised! I slid the pan in, closed the door as far as it would go, and then covered all the open area with aluminum foil! About half way through, I bravely 'un-foiled' the door and checked on it...it was working! I turned the pan around to stick the other end in and re-wrapped the door. 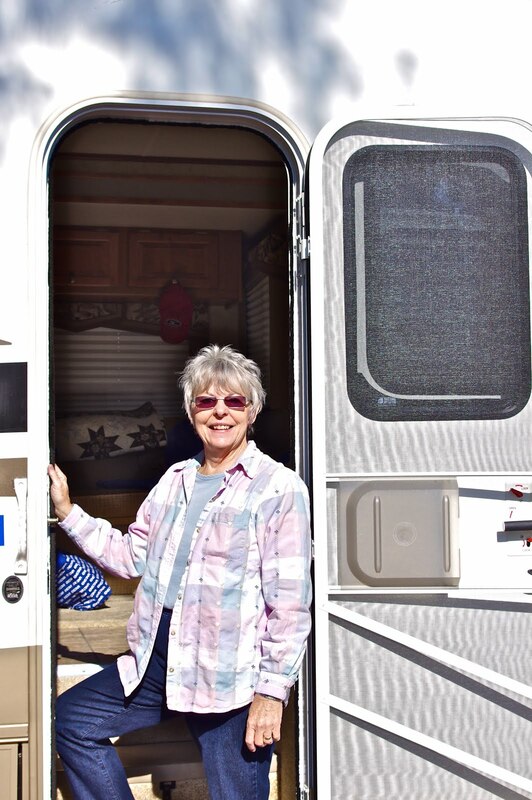 You can find all kinds of articles on traveling in an RV - places to go, things to add or fix in your coach, even recipes - but one thing everyone needs to bring with them, is a good sense of humor and a bit of old fashioned ingenuity! 'Cause I can tell you that even as a "newbie" to this wonderful world of traveling, those are things you will use, again and again!